Weekly BAA commercial bond rates fell -.04% t0 5.15%. 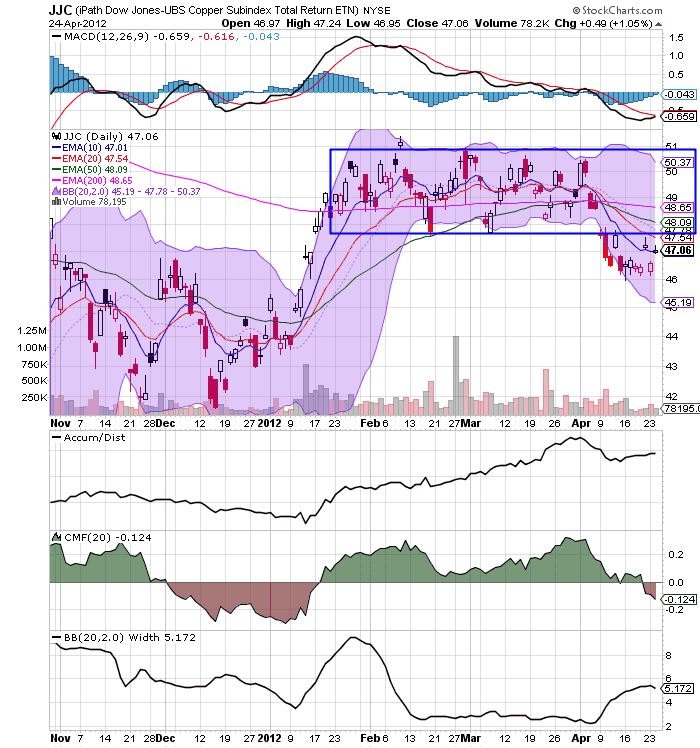 Yields on 10 year treasury bonds also fell -.04% to 2.00%. The credit spread between the two remained flat at 3.15%. This is significantly off its October lows, but has declined a bit since one month ago. The American Association of Railroads reported a +0.6% increase in traffic YoY, or +3000 cars. Ex-coal, overall traffic was up by 22,500 cars, or +3.6% YoY. Intermodal traffic was up 12,600 carloads, or +6.0%. Railfax's graph of YoY traffic continued to show that rail hauling of cyclically sensitive materials remains in strong improvement. The US' Austerity in Charts -- Or, "Where is the Government Takeover Again?" 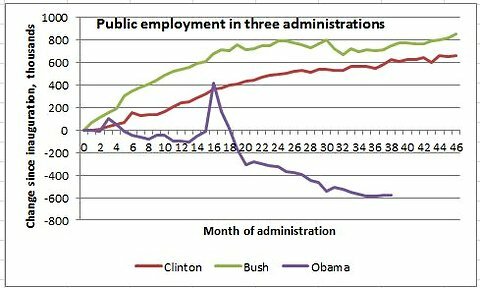 If public employment had grown the way it did under Bush, we’d have 1.3 million more government workers, and probably an unemployment rate of 7 percent or less. Krugman has been all over this story -- he was arguing against austerity long before I started writing about it. Plus, he is, after all, one of the premier economists on the planet. And he's right. The argument that confidence would return because of budget cutting is absolute garbage. However, let me go a bit deeper and explain why. First, the "austerians" assume that all government spending is bad and that all private sector spending is more efficient and effective. This is a pretty bold assumption not born out by the facts. The first chart shows total, real GDP while the second shows YOY GDP growth rates. 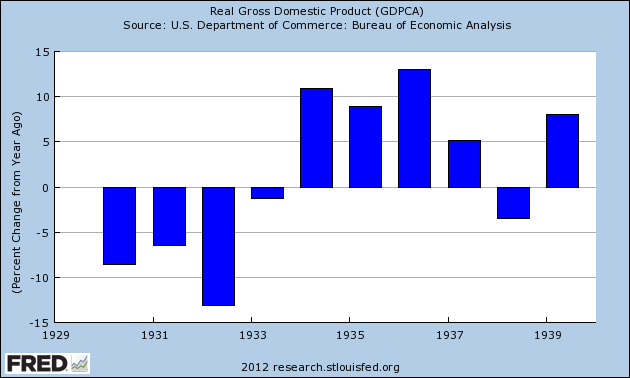 This chart shows that by 1937, real GDP was higher than 1929 GDP largely because of the tremendous growth seen in GDP which is illustrated by the lower chart. And - in case you're wondering -- the 1938 slowdown was caused by (drum roll please) austerity policies (you might want to read the Depression section in A Monetary History of the US by Milton Friendman to get a better idea of what happened). Many of the projects that were created during this period are still with us an paying dividends, such as Hoover Dam. Second, as demonstrated by the recent EU and UK experience, austerity slows growth (see here and here). This in turn creates a negative feedback loop -- lower GDP lowers demand and investment, which lowers GDP, etc... Put another way, austerity continues to lower confidence instead of raising it because no one wants to invest in a slow growing economy. 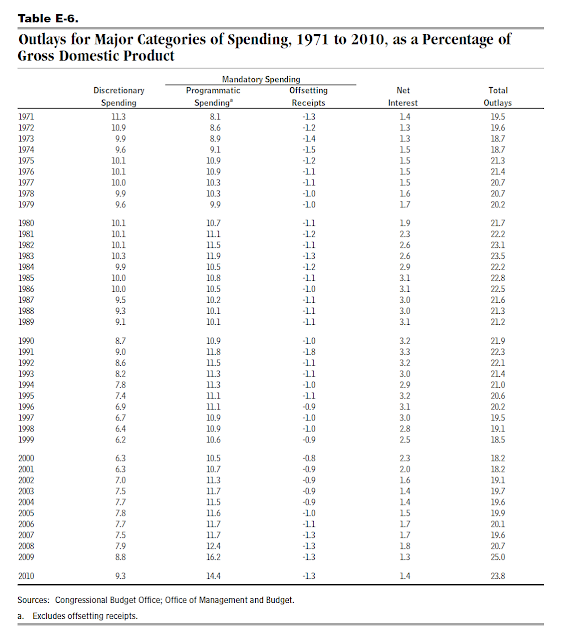 It shows government spending as a percentage of GDP going back to 1971. Notice that this number has -- for the last 40 years -- been about 20%-21% of total GDP. Some of this is mandatory spending some of it is discretionary. But the point is this: it's always been there and it's a part of the economy. This is one of the reasons I talk so much about the GDP equation (C+I+X+G=GDP), hoping that taking readers back to their days of basic math will somehow jog their memory regarding the policy implications of simple addition (which is regrettably lost on many people). Moreover, government provides things we use on a regular basis that have short term and long term implications. 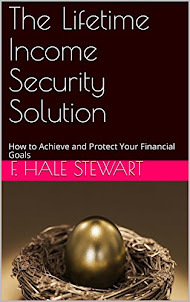 The short term implications are things like income for people in the form of social security and unemployment benefits. People spend these on a regular basis in order to live. Then there are less visible (but still incredibly important) things like infrastructure and educational support which have pronounced long-term benefits for the country by bolstering and developing the physical and personal elements of the economy. Both of these areas -- physical and personal infrastructure -- are seriously lacking in the US and need immediate attention if we're going to compete with countries in the 21st century. The SPYs spent 12 days consolidating between the 136-139 level. 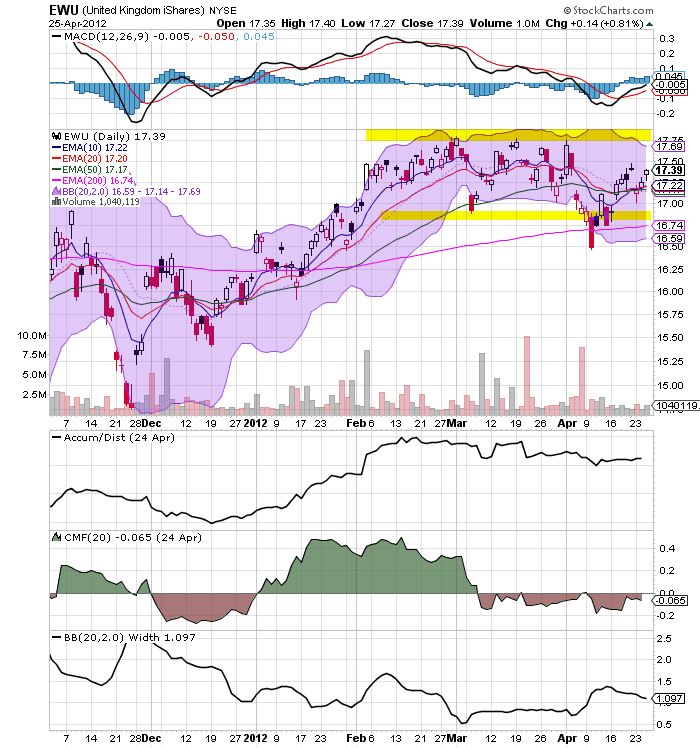 However, yesterday, prices popped higher, breaking out of the range. 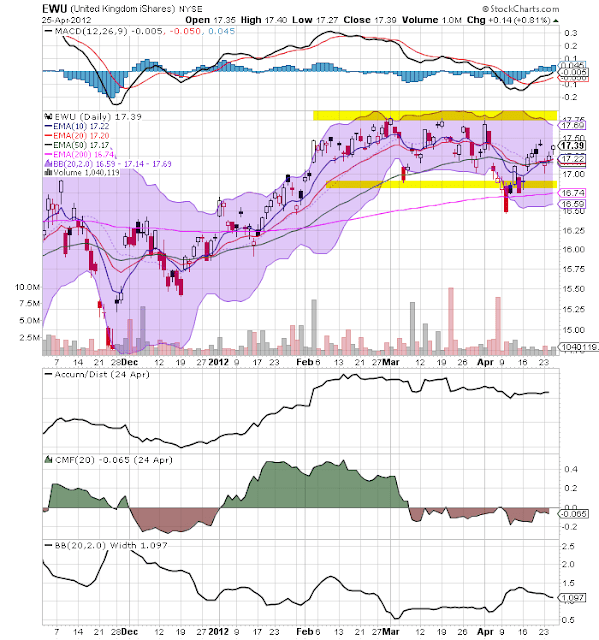 The daily chart shows prices moving beyond the trading range along with a buy signal about to emerge from the MACD. However, given the fundamental backdrop, I'm not thrilled by this rally and need to see a lot more evidence to even think about getting excited. The above chart of the IEFs is a big reason to not get excited about the move. 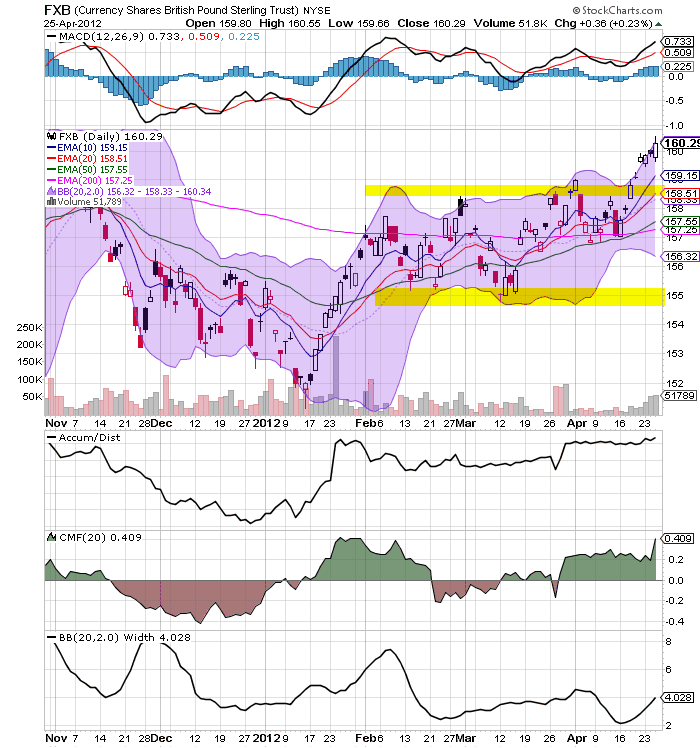 Treasury prices are at high levels in reaction to the underlying economic situation. This is going to take money out of equities. 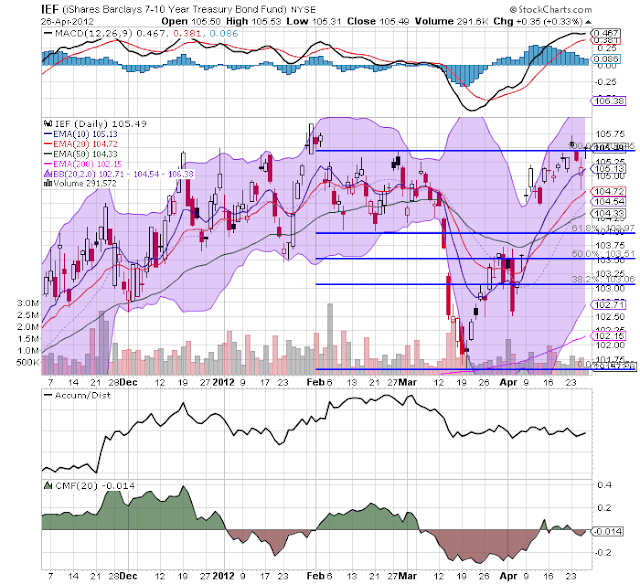 In addition, consider the EDE charts above. Only the Chinese market (second from top) is showing any propensity to rally; all the other markets are at best treading water. Should We Be Concerned About the Following? 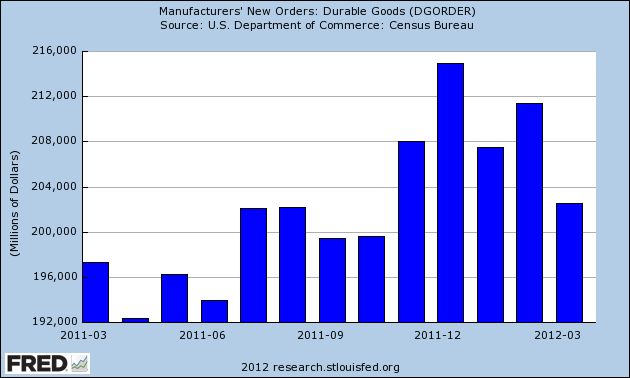 Durable goods orders peaked in January a bit below the 216,000 level, but are now declining. For the last 5 months, the number has clustered around the 208 level. 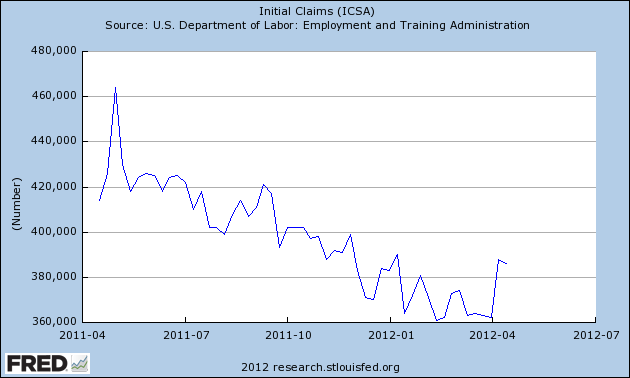 Initial claims have spiked this month. While the overall series is still down, these upward moves are concerning, especially considering the weaker reading coming from the latest US employment report (+120,000). 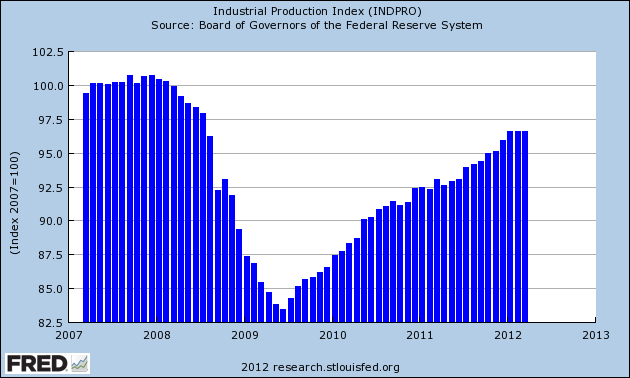 Industrial production has stalled for the last three months. The above data series are extremely noisy, so it's important not to read too much into the monthly gyrations. At the same time, all of these are occurring at the same time, which is, in and of itself, a concerning development. 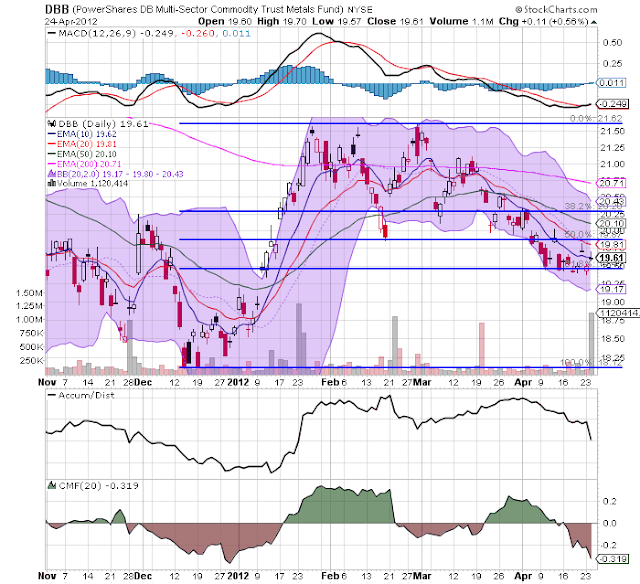 Is the US/China Trade Balance Stabilizing? 1.) 1985-2000; the slow build-up. 3.) the 2009/10 period to today -- a possible leveling-off. A shortage of labor means higher cost. OK, make that 101 false prophecies . . .
People Are Finally Figuring Out: Austerity Is Stupid by Hale Stewart. The British pound was trading in a range between 155 and 159 until it broke ouy a week ago. The upside move was caused by the BOE's minutes indicating that no further easing was coming done the pike. Given the overall tenor of the British economy, I would expect to see a sell-off soon, with prices moving to at least the 10 day EMA. 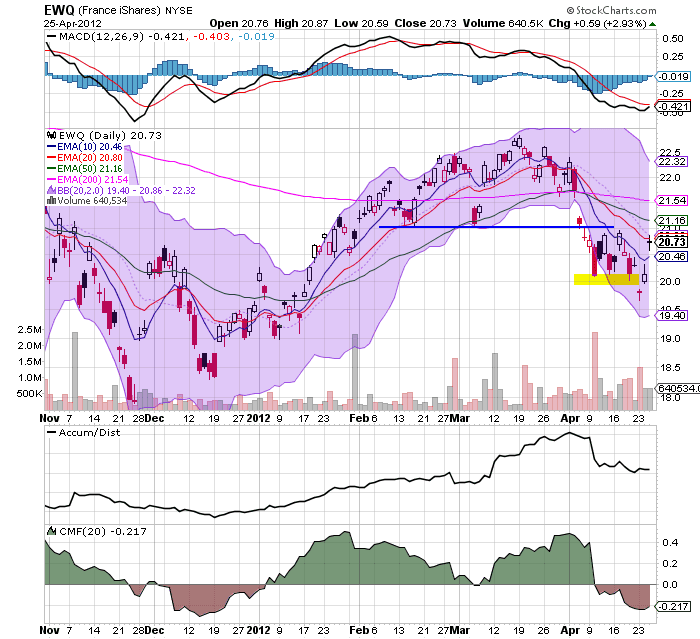 The French market broke support at the 21 level, moved to the 19.75 area and has since rebounded. Prices are now entwined with the EMAs. Given the political situation in France, this is a very difficult market to read. 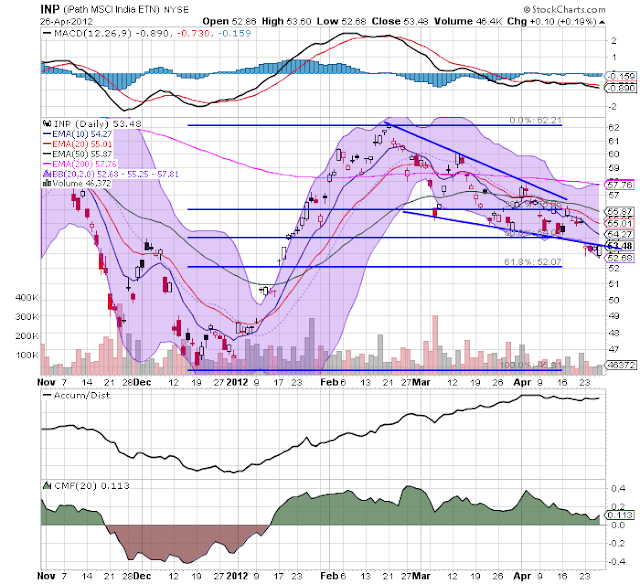 Emerging Europe has been in a downward sloping channel for the last month and a half. 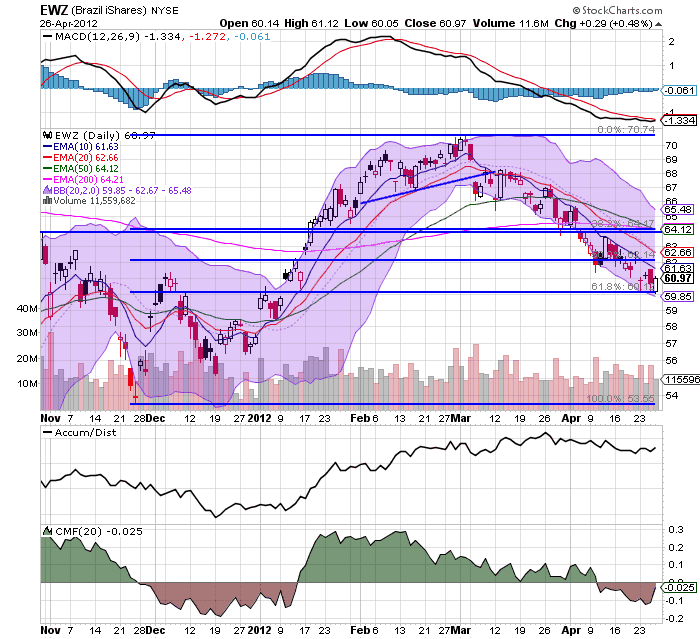 Prices are now below the 200 day EMA, and the shorter EMAs are below the 200 day EMA and are moving lower. 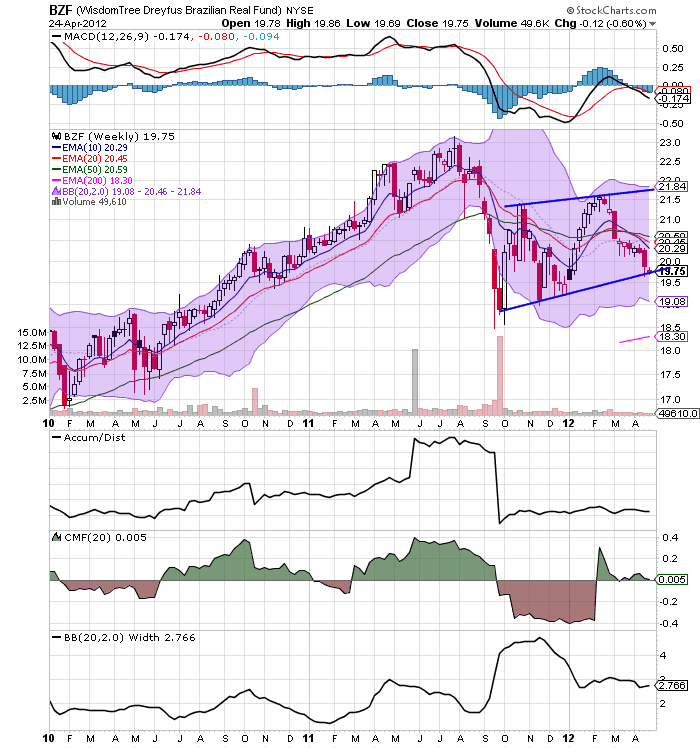 Money is leaving the market, and momentum is weak. Prices have found support at the 50% Fib. level. The good news in all the equity charts above is that we're not seeing a massive and sharp sell-off. 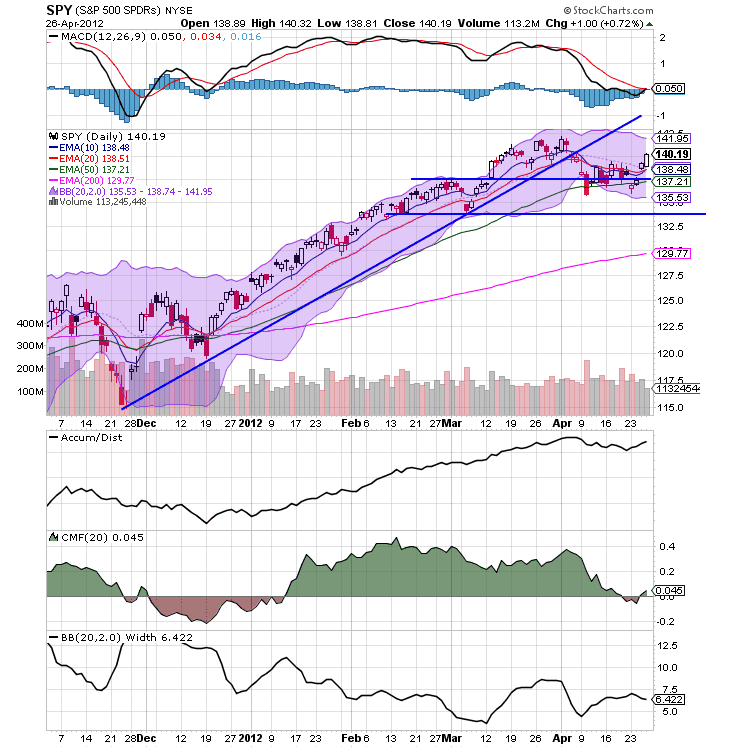 Instead, buyers are moving in to buy on the dips, indicating there are still enough people who see value in the markets. Given the weakening position of the European economy overall, that, in and of itself is a good thing. I wrote the first 1/2-2/3 of this story over the weekend,hence the reason for the somewhat backwards presentation of material. 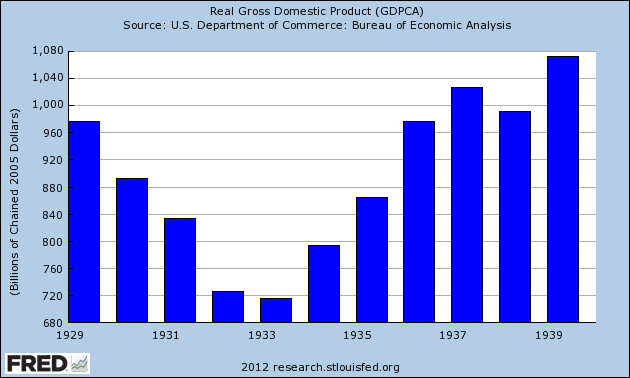 The GDP graphs do not include the latest information. However, it goes without saying (so I'll go ahead and say it), yet another country is learning a lesson the hard way. It's another successful austerity program! According to the third ONS estimate, GDP had fallen by 0.3% in the fourth quarter of 2011, 0.1 percentage points weaker than reported in the second release. The ONS had also revised down the path for household consumption during 2011 such that the level at the end of the year was 0.5% lower than previously estimated. Together with an upward revision to households’ income, this implied a sizable revision upwards to the estimated household saving rate. This now appeared to have fallen back only modestly since its peak in 2009. The top chart shows total GDP, which is still below pre-recession levels. Also note there were two years of decline (2009 and 2010) with a slight increase in 2011. The second chart shows the quarter to quarter growth, which shows that in three of the last give quarters UK GDP has shrunk. 2.) The deposit base is increasing, which increases bank reserves. This can lead to an increase in overall credit, assuming there is an increase in demand. In line with the usual pre-release arrangements, the Governor informed the Committee that manufacturing output had fallen by 1% in February and that output in January had been revised down. This was somewhat at odds with the more positive message from the corresponding business surveys. The data on service sector output in January were consistent with solid growth in services in the first quarter of 2012. 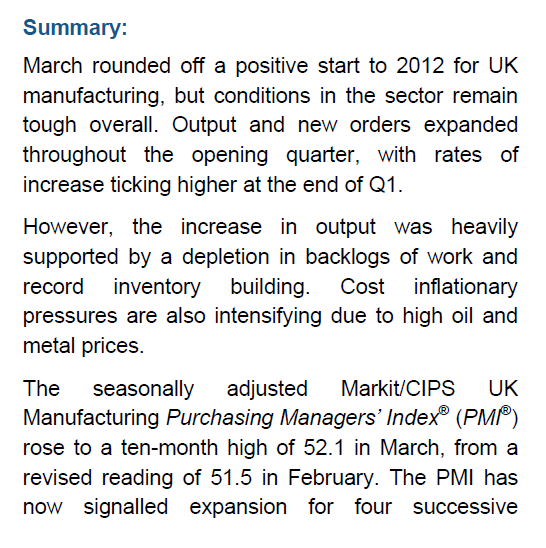 The CIPS/Markit indices for manufacturing, services and construction had all risen in March and the composite expectations balance had reached its highest level in over a year. The BCC Quarterly Economic Survey had recorded rising sales balances for both manufacturing and services in the first quarter. And the Bank’s Agents had reported a broad-based, if still modest, pickup in output growth over the previous three months. Consistent with these reports, household and corporate broad money growth had increased in January and February on a three-month annualised basis. 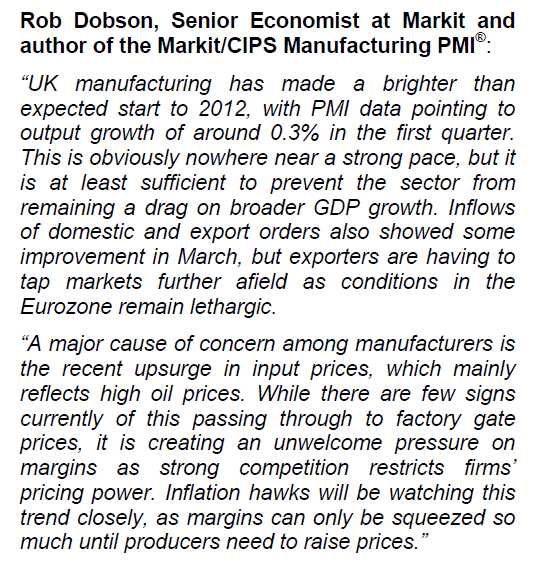 In short, UK manufacturing increased because it filled old orders and replenished inventories. In addition, the UK's primary market -- the EU -- is slowing down. The Market economists comments highlight the basic conclusion to draw: manufacturing won't be a drag, but nor will it be a strong contributor to the economy in the first quarter. 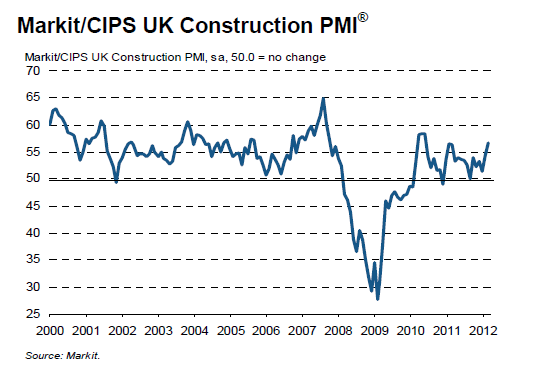 For the second month in a row, the ONS had reported a particularly large contraction in construction output, which it estimated to have fallen by around 12% in each of December and January on a non-seasonally adjusted basis. Even if activity were to rise strongly in February and March, measured construction output was likely to show a very sharp fall in the first quarter as a whole. 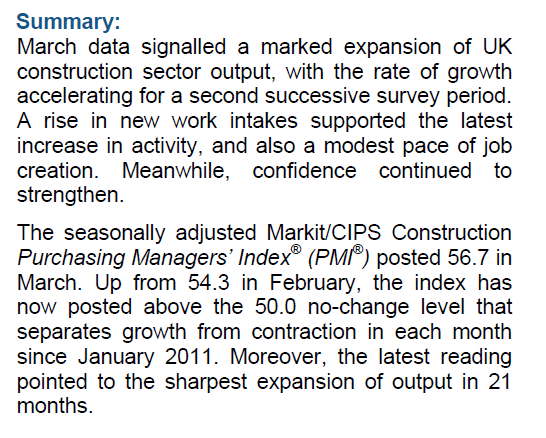 This was at odds with other indicators of construction activity from CIPS/Markit, Experian and the Bank’s Agents, which had generally pointed to much smaller declines around the turn of the year. Although construction orders had been weak, the Construction Products Association was expecting only a modest reduction in output during the year as a whole. Only time will tell who is right. However, an increase in construction spending would be most welcome as this has an ancillary economic effect down the line. Britain's economy has fallen into its second recession since the financial crisis after an shock contraction at the start of 2012, heaping pressure on Prime Minister David Cameron's government as it reels from a series of political missteps. Britain's Conservative-Liberal Democrat coalition has seen its support crumble after weeks of criticism over unpopular tax measures in last month's budget, and is under further pressure from revelations about its close links with media tycoon Rupert Murdoch. With local elections taking place on May 3, there could hardly be worse timing for Wednesday's news from the Office for National Statistics that Britain's gross domestic product fell 0.2 percent in the first quarter of 2012 on top of a 0.3 percent decline at the end of 2011. Most economists had expected Britain's economy to eke out modest growth in early 2012, but these forecasts were upset by the biggest fall in construction output in three years, coupled with a slump in financial services and oil and gas extraction. In the first part of this overview, we looked at housing sales and construction, with its attendant effects on employment and GDP. It appears that 6 years after the housing bust started, we are finally seeing a modest uptrend from a very low level. Now let's look at housing prices. If sales and construction are 3 years after their worst levels, the debate about prices is whether we are bottoming now or there is further to go. There are a number of indexes, all relying on different methods. There are asking prices indexes, median and mean sales price indexes, and repeat sales indexes. Within each type there are seasonally adjusted and non-seasonally adjusted metrics. I'll look at each of the three groups in turn. If you want to avoid the verbiage and the graphs, skip to the conclusion for a list describing the results. The NAR just entered this fray, by a non-seasonally adjusted index made up of all of its listings. The NAR's index showed that asking prices were still negative, down 2.5% in December 2011, but turned positive YoY by February, up 6.82%. As of its last report for March, asking prices were up 5.56% YoY. Nationally, asking prices on for-sale homes – which lead sales prices by approximately two or more months – were 1.4 percent higher in March than one quarter ago. Prices increased month over month 0.9 percent in March and 0.6 percent in February. The Trulia Price Monitor is seasonally adjusted, so these monthly and quarterly increases are on top of typical springtime price jumps. . . . According to the Monitor, asking prices had been declining prior to February and reached a low in January. 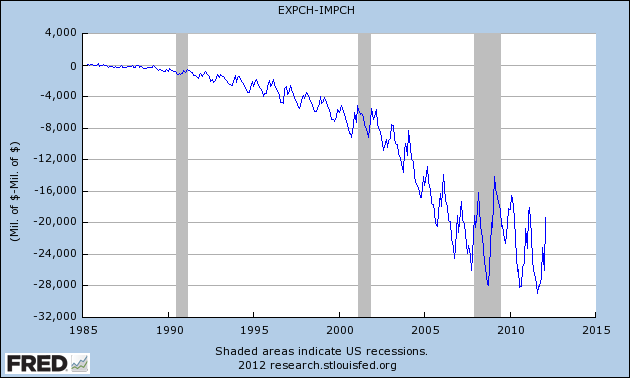 Throughout 2011, asking prices rose slightly in several months of the year, but never more than 0.2 percent in a month. Asking prices in March were 0.7 percent below their level one year earlier. Mean sales prices are also positive by 11.7% YoY. Radar Logic 25 MSA Composite data reported on residential real estate transactions (condos, multi and single family homes) that settled as late as February 20 and averaged for the month indicates that with increasing spring transactions has come an increase of prices (the typical trend) with the national index increasing 0.71% since January but falling 3.76% below the level seen in February 2011. There are five sources of repeat sales and other indexes which control for price or quality of house. The first is not seasonally adjusted, so we must look YoY. The other 4 are seasonally adjusted, so a turn in trend can be spotted without waiting for the YoY metric to turn. shows national home prices, including distressed sales, declined on a year-over-year basis by 2.0 percent in February 2012 and by 0.8 percent compared to January 2012, the seventh consecutive monthly decline. Excluding distressed sales, month-over-month prices increased 0.7 percent in February from January. The CoreLogic HPI® also showed that year-over-year prices declined by 0.8 percent in February 2012 compared to February 2011. U.S. house prices rose 0.3 percent on a seasonally adjusted basis from January to February ... While prices in January were unchanged according to initial estimates reported in the last [House Price Index] release, the January result has been revised downward to reflect a 0.5 percent decrease. For the 12 months ending in February, U.S. prices rose 0.4 percent, the first 12-month increase since the July 2006 - July 2007 interval. This was still not as great as the typical 5.2% YoY decline of the past 2 years. Finally, we come to the Case-Shiller home price indexes. Yesterday almost every report focused on the data that "the 10- and 20-city composites were each down 0.8% in February from a month earlier, and fell 3.6% and 3.5% respectively from the year-ago period." In so doing they completely missed what was perhaps the most significant installment of this report in 5 years. Except for the fact that there seems to be a statistical glitch in the Case Shiller report for March of the last 3 years, causing each March to break trend to the downside by about 1%, it looks very much like the Case Shiller home price indexes have made a bottom with yesterday's report. Case Shiller - bottomed in January? All of the list prices indexes and all but one of the median/mean sales price indexes appear to have bottomed. One of the repeat sales indexes has bottomed, and the most famous - the Case Shiller index - looks very close to a bottom if it didn't just happen. Three other repeat sales indexes continue to show declines, but in two of them the rate of decline is rapidly abating. 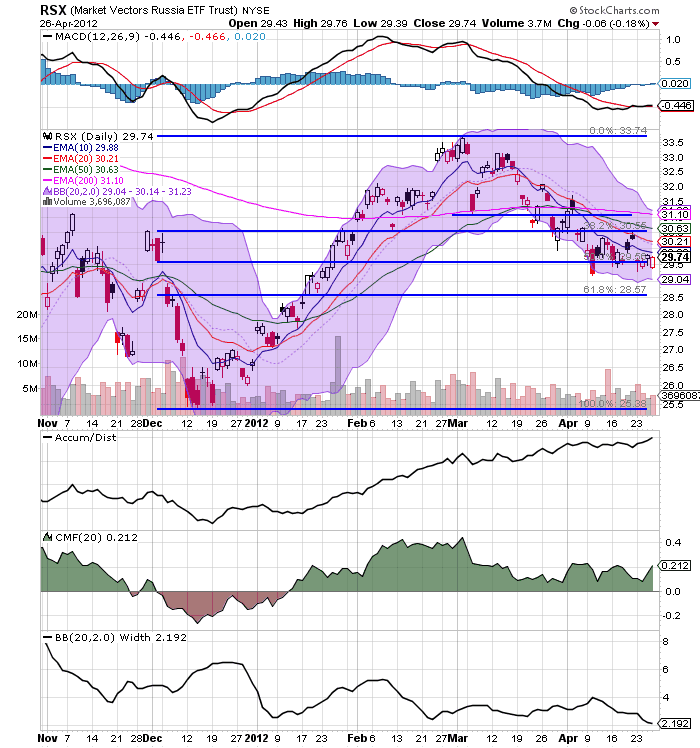 After trading between 47.75 and 5 for nearly three months, the copper ETF fell through support and is now aw the 47 price level. 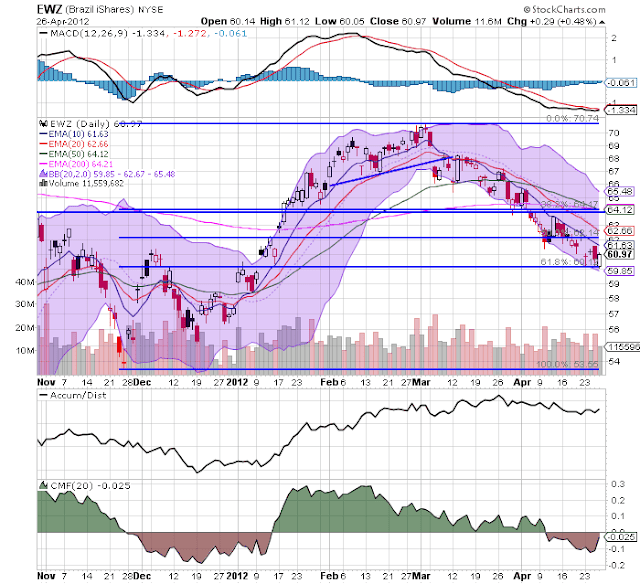 But, in addition to falling through support, prices have dragged EMAs lower. In addition, prices are now below the 200 day EMA -- bear market territory. While the overall loss is only 6%, the underlying technical damage is fairly bad. 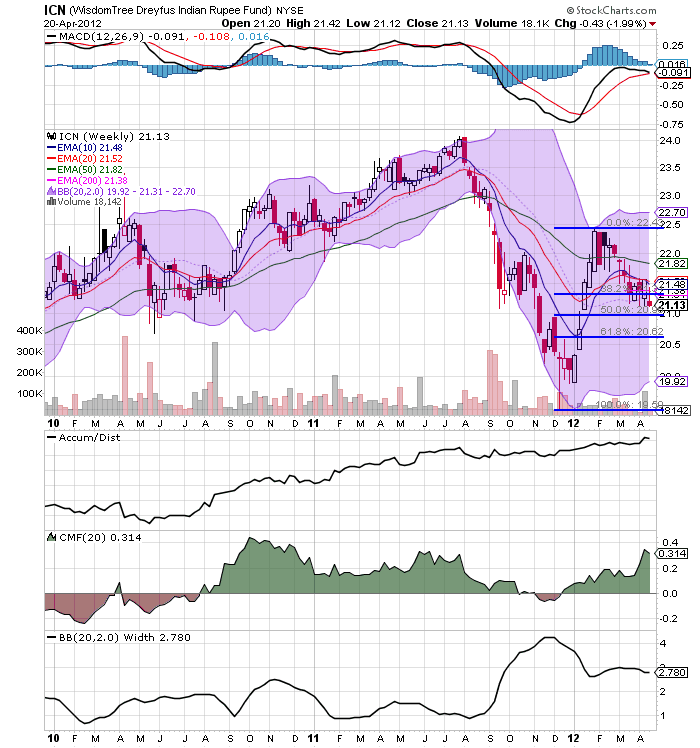 Industrial metals -- which include copper, have been moving lower for about two months. They're total move lower totals almost 10% and, like the copper chart, the move lower has brought the EMAs lower. 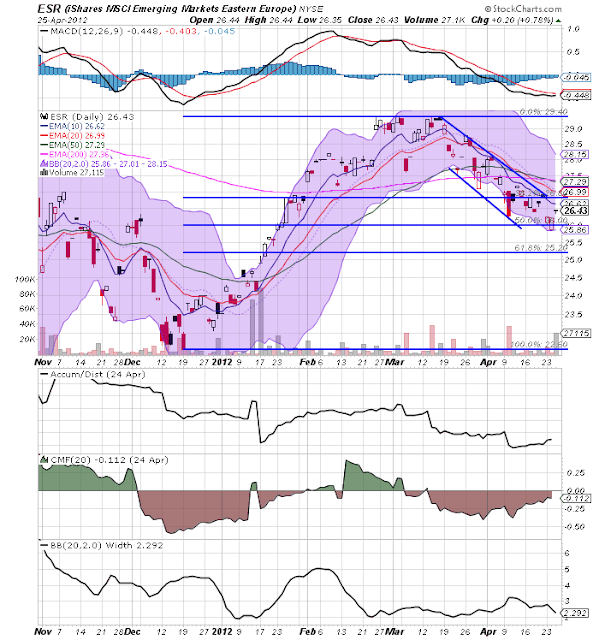 However, a net positive for both charts is each's respective MACD is about to give a buy signal. 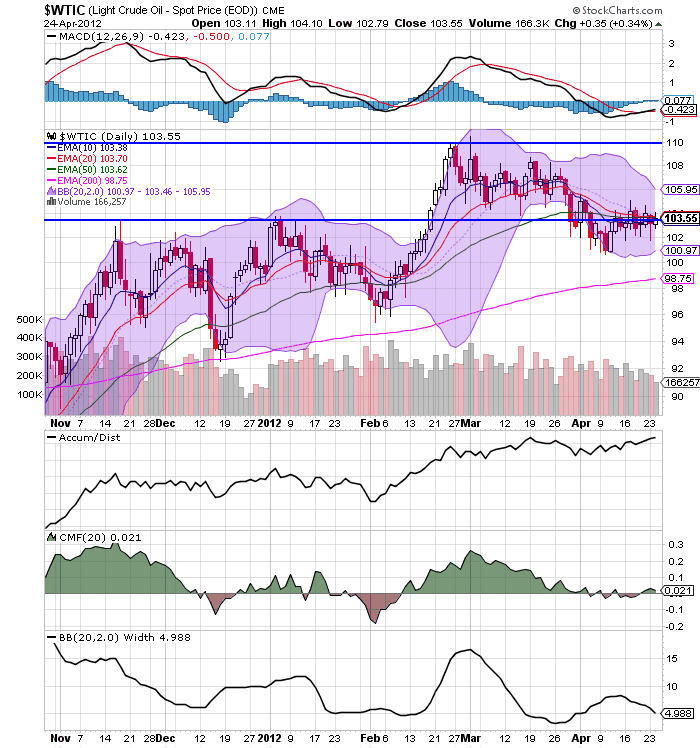 Oil is in a very tight range and has been since the beginning of the month. 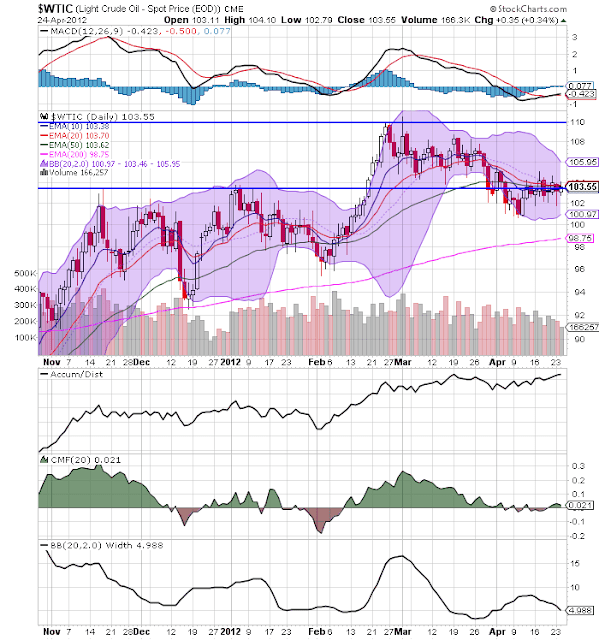 The only reason oil has not dropped like copper is that, even in a recession, there will still be some oil demand. All three charts above indicate that traders are looking at a slowing economy. 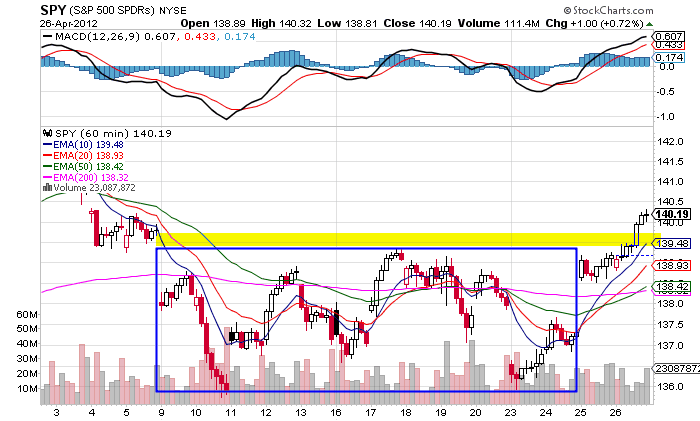 However, also note there is no crash -- simply a slowdown at this point. 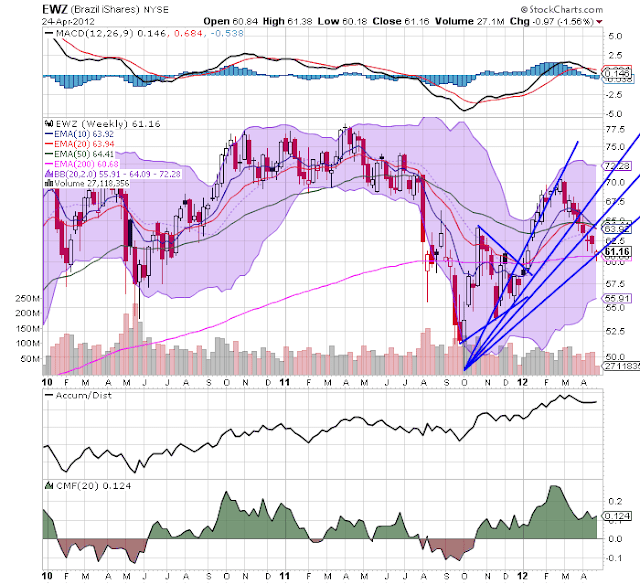 The real is at the lower end of an upward sloping channel that started last fall. A convincing move lower would indicate that forex traders are betting on a weaker Brazil. The Brazilian market is also continuing its move lower. Prices are now right at the 200 week EMA and the lower Fibonacci fan. Is India's Growth in Trouble? The India population stands at over 1.2 billion people. That means that GDP must keep growing at a fairly strong clip simply for the economy to tread water. A fast rate of growth is imperative for the country to lift the standard of living for more and more people. Yet, the annual rate of GDP growth is dropping. While 6.1% is nothing to sneeze at, it must be placed into the population picture. Remember, with a growing population, rapid growth (8%+) is mandatory. However, there are signs of problems. First, the central bank faces the classic policy squeeze of high inflation and slowing growth. Indian inflation remains between the 8% and 10% level, where it has been for the better part of a year. To tame inflation, the Indian central bank has been raising rates, which obviously has a negative impact on overall economic growth. The above chart of the rupee shows the overall damage of this situation. After falling neary 20% (from 24 - 19.5), the rupee rebounded nearly 15%. However, since the mid-Spring, the rupee has been falling as investors have lost confidence in the economies ability to grow. Early indicators suggest that growth may have bottomed out in Q3 of 2011-12 but recovery may be slow during 2012-13. Lower global demand, domestic policy uncertainties and the cumulative impact of monetary tightening lowered the growth rate to below seven per cent over the last two quarters. Industrial growth remains subdued due to supply-side bottlenecks, particularly in the mining sector, and moderation in investment demand. With measures being taken to remove supply-side bottlenecks, progress on fiscal consolidation could create conditions for a more favourable growth-inflation dynamic. The growth slowdown has been driven by a sharp fall in investment, some moderation in private consumption and fall in net external demand. 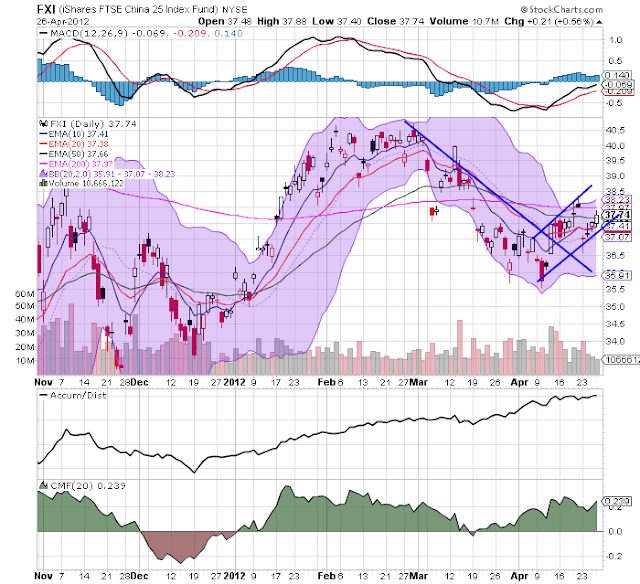 The drag from investment is likely to continue in the near term. Corporate investment intentions continued to drop during Q3 of 2011-12. Consultations with industry and banks suggest that new project investment continue to be sluggish. However, if increased capital outlays in the latest budget are speedily translated into government capital expenditure,it could crowd in private investment. The balance of payments (BoP) came under significant stress during Q3 of 2011-12 as the current account deficit (CAD) widened substantially and capital inflows declined.This resulted in a drawing down of foreign exchange reserves.The wider CAD, increase in external debt,weakening net international investment position (NIIP) and deteriorating vulnerability indicators underscore the need for more prudent external sector management and demand management policies to limit the absorption impact that is keeping import demand high.While capital inflows have revived somewhat in 2012, BoP risks remain due to high oil prices and uncertainties in the global economy. So, business is holding onto cash instead of putting it to work. That's before we get to the balance of payment (BoP) issue. Less money is coming into the country for investment, meaning the RBI had to tap its foreign currency reserves, draining its position. There have been some great blog posts on this issue that really cover the issues well.